They're full of nutrients like Omega 3 and 6 fatty acids, but overconsume them and you're unlikely to thrive on a raw food diet. First off, nuts are rarely present in health food stores or supermarkets in an raw state. At the very least they've been dehydrated to stop them from going rancid, even if they're technically raw. Even completely raw nuts are very hard for the body to digest, and are also high in fat. 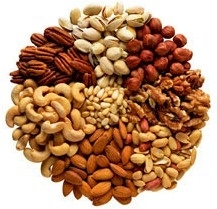 Nuts and seeds range from 55 to 90 percent fat. As stated in the fatty fruit section above, fats should not be present in a diet at above 10 percent of calories, as they will sap your energy and health. Truly raw nuts should be eaten no more than once or twice a week in small quantities, they they are eaten at all. If they are consumed, they should be eaten only irregularly and with ample time left for digestion. It can take up to 10 hours for them to leave the stomach, compared to just a half hour to and hour for fruit. Eat them with caution and irregularly. Almond, Filbert, Cashew, Brazil Nut, Pistachio, Walnut, Pumpkin Seed, Sesame Seed, Flax Seed, Peanuts*, etc. *Peanuts are not technically a nut, but are often considered to be one. See how this list of nuts and seeds fit into a healthy raw diet. See what foods are ideal on a raw diet.